Crowns are tooth-shaped caps which fit over your adjusted tooth. Crowns are used on teeth with very large fillings; previously root-treated teeth or fractured teeth. Crowns can also be used cosmetically to improve the appearance of your teeth. Crowns are usually made of porcelain because the colour can be matched to your other teeth. Some crowns can also be made of gold or silver. A Bridge is used when you have one or missing teeth. 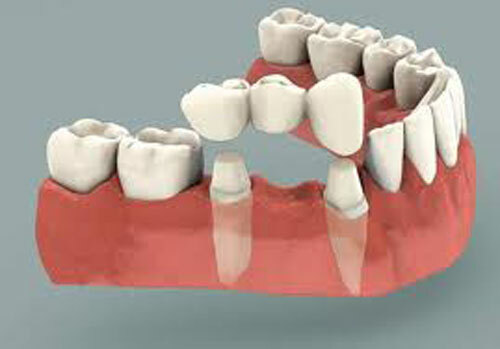 It is usually a combination of 3 or more crowns joined together to replace a missing tooth/teeth. Veneers are thin custom made shells permanently bonded to the fronts of your teeth. They are usually made of porcelain. Veneers can transform teeth that are broken, chipped, stained or have large gaps between them, and some crooked teeth as well. Veneers improve the colour and shape of your teeth and give a lift to your smile. Your teeth don’t lose any of its strength and you will be able to bite and chew normally. Veneers are also highly resistant to staining. Note: Veneers are very thin and translucent and are not as effective on Heavily filled teeth, blackened or root filled teeth. In these cases, crowns are more suitable. It does not matter whether teeth are lost through accident, disease or caries, dental implants are an excellent tooth replacement for many patients as no other teeth are involved. 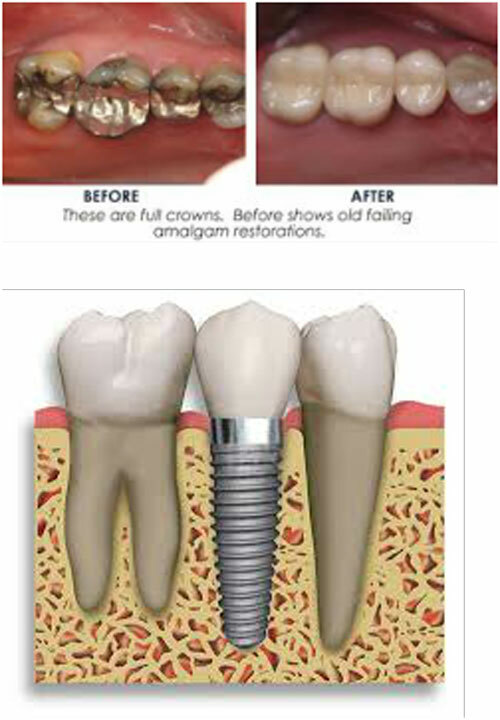 An implant is a titanium screw that is placed into the jaw bone where a tooth/teeth have been lost. A crown is them screwed onto the implant. Implants have the look and feel of natural teeth and can replace teeth without compromising the adjacent teeth.